Do you dream about sitting on a porch with a gentle breeze and your favorite book? Or maybe you dream of the sand between your toes and a glass of wine in your hand? At Amen Corner, these dreams are just a step away. Amen Corner has one of the best locations you could ask for in Rosemary Beach. Situated on Eastern Long Green Park and within steps of the Town Centre, you can walk to restaurants and shops or enjoy games on the green. Amen Corner is a home away from a home with all the luxury and amenities you expect. This classic Rosemary Beach cottage features ample porches, luxurious furnishings, and serene 'sea' colors. The first floor has a spacious foyer, stained concrete floors, 10ft ceilings, master bedroom & bath, a bunk room with guest bath, and a large laundry room with storage. The master suite has a king size bed, raised ceilings, a large walk-in closet, double sinks in the master bath, and generous tiled shower with a sitting area. There is also a private courtyard off the master. The bunk room includes 2 sets of bunks and has a bathroom with shower. Head up to the main floor in the open stairway with soaring ceilings and windows. This floor features 11ft ceilings, architectural details, beautiful pecan wood floors, quality craftsmanship abundant space, and is filled with natural light. The inviting living and dining rooms are open to the lovely kitchen. The large kitchen is finished with beautiful granite, dark wood cabinets, stainless steel appliances, a breakfast bar, and a large pantry. There is also a porch right off the kitchen with a grill. The spacious living and dining areas have comfortable seating and charming furnishings. The highlight of the main floor has to be the corner balcony overlooking Eastern Long Green Park. With spectacular views, you can enjoy a glass of wine while watching games on the green or dinner out on the porch. Another great porch on this floor right off the living area gives you incredible views of roof tops and the park. This porch also connects to the bedroom located on this floor. It features a king size bed and the bathroom has lovely subway tile with a tub/shower combination. A three minute walk will take you directly to the beautiful sugar sand beaches where you can enjoy water sports or sit back and take in the summer sun. Rosemary Beach has a total of four pools (including one heated), a top of the line tennis center with eight clay courts, and the Rosemary Beach fitness center offers top of the line equipment with personal training and instruction. 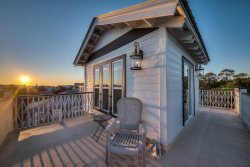 You can have as much or as little time to spare as you like with the 8+ restaurants and multiple shops located in Rosemary, and a short walk or bicycle ride down 30A will take you to even more. 1) We do not offer Travel Protection Insurance in our quotes. You may obtain insurance independently. 3) 3 bikes are included in the rental. To utilize, waiver must be signed and received before code provided. Please contact Saxon Smith with Bikes 4U 30A at 850.399.1230 with any bike questions. 4) CONSTRUCTION IS IN PLACE ALL OVER 30A. We cannot be held responsible for construction near the home. There is currently construction about 1 block away. Dylan was great! Check in was a breeze! We loved the house and location! The members of the team were very responsive and helpful with any and all questions. The details of checking in and out were very clear and easy to follow. It was really nice not to waste time at a rental office to pick up keys, etc. We loved Amen Corner and would definitely recommend it to others. We had two adults and four college age kids, and it was great. We will look into other properties at Rosemary in the future, because we want to bring another family with us, and we will need a fourth bedroom. Everything went smooth & easy. Very friendly and professional.